An unidentified man was arrested in Lucknow on Thursday, 7 March after a video of him thrashing Kashmiri street vendors in Lucknow went viral on Wednesday, ANI reported. Two Kashmiri dry fruit sellers were assaulted in broad daylight in Lucknow by a pair of saffron-clad men on Wednesday, 6 March. While one of the Kashmiri men is seen crying as he is being beaten with sticks, the other is seen being asked to produce his identity card after some locals came to the rescue and stopped the attackers from further thrashing, The Quit reported. 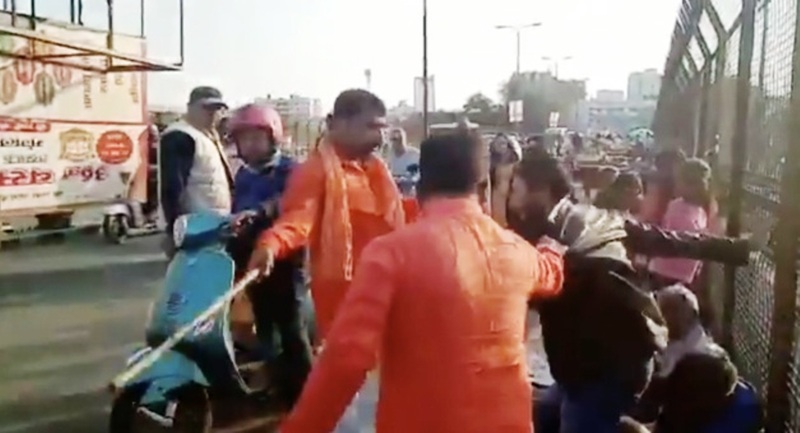 One of the assaulters, Himanshu Awasthi, self-proclaimed “former BJP politician” and member of the Vishwa Hindu Parishad, posted videos and photos on his Facebook profile boasting about thrashing Kashmiris on the Daligunj Bridge in Lucknow. Another accused, Aniruddh Shyam, a member of Vishwa Hindu Dal, went live on Facebook with a video of them thrashing the Kashmiri men. The video has now been deleted from his profile. Lucknow Police later said in a tweet that a case has been registered against the accused and necessary action is being taken, the report mentioned. Kashmiris across the country were threatened and attacked in the aftermath of Pulwama attack which killed over 40 CRPF japans. The Kashmiri suicide bomber, Adil Ahmad Dar, was affiliated to Pakistan-based terror outfit Jaish-e-Mohammed, reported The Quint.